Pop-ups are great way to create brand experiences for customers, especially for online shops! In this fast paced life even stores are coming and going, like waves. And anyway, what's the point of paying high fixed rents, when you are able to keep your shop open seasonally. A pop-up shop is a short-term, temporary retail event that is "here today, gone tomorrow". 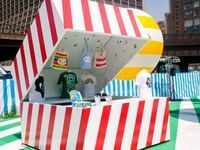 Pop-up retail is the temporary use of physical space to create a long term, lasting impression with potential customers.